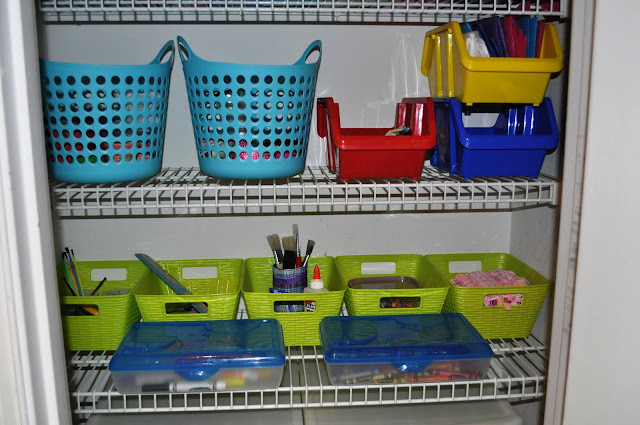 The Collected Interior: A Craft Closet...Organized! Ahhh...organization! I am lucky to live in a home with a ton of storage space. Our kitchen alone has a large walk-in pantry, a small wine room the hubby built with wine storage above and cabinets below, and yet another pantry closet perfect for smaller kitchen appliances. 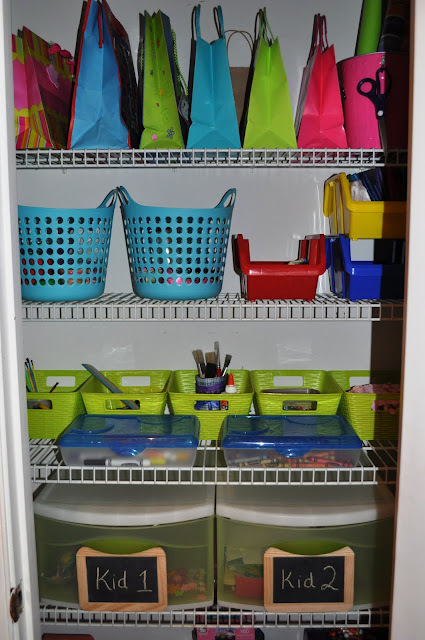 However, this third closet space has become a clutter magnet for both kitchen accessories and craft supplies we've accumulated over the years. 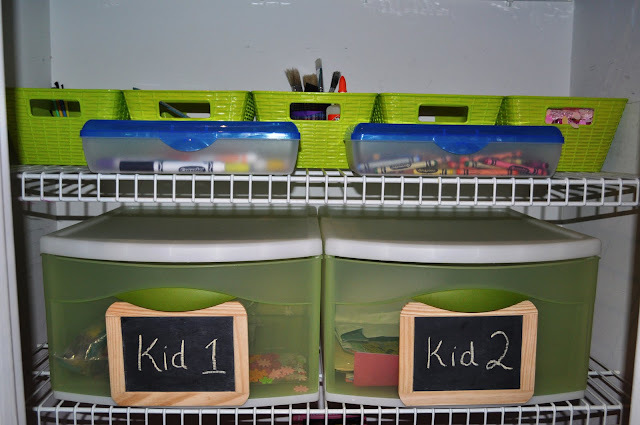 Below are the fun storage bins I bought from the Dollar Store! Their small sizes are perfect for art n' craft supplies. I still need to pick up one more! And every good craft space needs storage for gift bags and wrapping paper! Here I repurposed this ice bucket as a storage bin for wrapping paper! Aren't these little chalk boards cute? Yup, there just for fun! This project was fun, easy and only took an hour to complete. 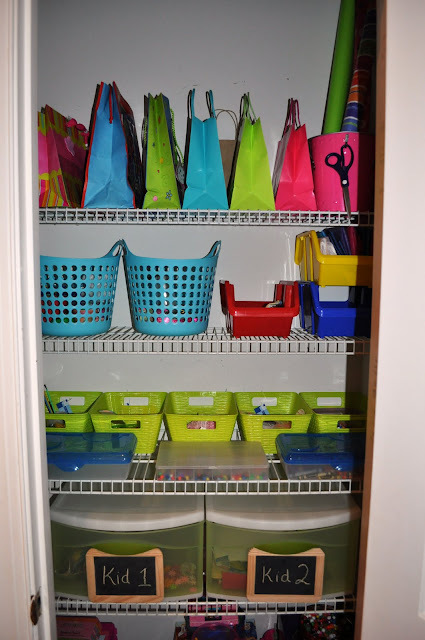 Now my kids and I have a craft closet that's organized, functional, and a whole lotta fun! Your craft closet looks great. I bet your kids love being able to find everything now. I love an organized closet. The bright colors add so much too. I am loving the bright colors. What a treat for the eyes when you open the doors!! Very clever dear lady. Well done! So colorful and cute! I love my craft closet..although, I must admit that right now it looks like a disorganized nightmare. Funny how that happens over time! Ugh. Stop by and enter my jewelry giveaway if you get the chance! Great containers from the dollar store, Jane! I have to redo my craft closet, too, but not so much to organize but label since I am using baskets. I already have the tags made up, just need to actually do it! Yeah for organization! I love how fun and colorful it is. Such great storage solutions for so little dough! Don't you love quick projects with awesome results? Your closet looks great! I LOVE your closet! It makes me wish we had copious amounts of storage space in our home. I laughed at your "kid 1, kid 2" blackboards... reminded me of "thing 1, thing 2" from Dr. Seuss! the only thing i dont love about your closet? that is itsnt mine. It is so bright and cheery and organized. Is kid 1 and kid 2 like Thing 1 and Thing 2? I envy your craft closet and all the storage in your house. I don't even have a linen closet let alone a craft closet :( This turned out great thought! Oh....YOU. ARE. GOOOOOD. Wow! It looks great. So jealous of all your storage space. I have to carve out space in my house. Built in 2006, soaring ceilings, but dinky storage. Why, oh why? Wait, I know. MEN designed it. Go figure! Looks great! I'm going to link to you tomorrow on my Tour Tuesday post. So bright and colorful - I love it! Wow, what an organized closet!! Can you come do mine? haha! It looks wonderful! Because of our attic reno, our guest bedroom and closet look like they both exploded. So I'll have some good before and after's for you then. :) Great job and so thrifty! What a DREAM to have such a beautiful, colorful, organized closet like that! I'm so envious! Wow love all the bright colors it looks so nice and organized Great job! so great! my kids could make a mess in that in about two minutes. I'll have to put a lock on my closet door! LOVe this idea, Jane! You have inspired me! Also, I would love to have you link up to Thrifty Thursday. Be sure to drop by Tales from Bloggeritaville today and enter the contest to win a vintage inspired initial jar. Good Luck! I am loving those colors!! TOO CUTE!!!! It looks fabulous! I love how bright and fun it is! Ohhhh so bright and colorful..love it! If that doesn't get you in the mood to craft..nothin' will! I'll be tackling our family school/craft area in a couple of weeks! The bright colors against the white really have me inspired! I have alot of white shelving area and these types of colorful baskets will really brighten things up while keeping things in order! I guess I'm not the only one that caught that Cat In the Hat reference! So cute! The dollar store is just awesome for cute little plastic bins and such! You have some lucky kids! I love it! Clean and colorful! What a fun and cheerful organization job! What great craft storage that is! I like all of the bright colors, and the fact that you got lots of them at the dollar store! Ahhhhh! I ADORE an organized space! Stunning! WOW your craft closet looks great, and I love the all the colors. Great job. I love your bright colors! Doesn't being organized feel good? Great job! Wish I had the room to do this! Following you over from The Shabby Chic Cottage. I am a follower! I love the organization and I love the colors! Found this through Amanda's Show Me The Progress Party...thanks for sharing! I'm so glad I found your blog. I'll be using you for inspiration when I tackle the avalanche that is my craft closet. Thank you for sharing! That's SO awesome! I love it! I've been trying to figure out a way to organize my crafts. I think I'll head out to the dollar store now. looks great! It would make me happy every time I opened the closet. I am sure that is what you are going for-right? I love the bucket with the hook on it. Genius idea! As always thanks for the inspiration! Please, stop by if you can, I made some carrots look pretty cute! Please come to my house and organize my craft stuff! Your closet looks great! Your craft closet looks so fun & cheerful. I see lots of projects in your little ones' future! 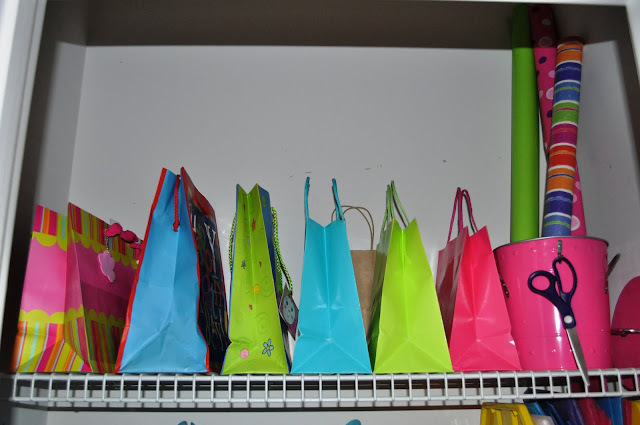 I'll be linking to your fabulous closet soon from dollar store crafts! I get to be your fiftieth comment "WOOT WOOT"! I love it! Organized and fun punchy colors. Your chalkboards remind me of "Thing 1" and "Thing 2". So much FUN!! Organized and colorful! Looks great! What I wouldn't give for all of your extra storage! Thanks for linking up to Make it Yours day at My Backyard Eden.